As your local Mountain Brook dentist, one of my roles is to help you take care of your mouth. Sometimes mouth sores can be an issue, and while Mountain Brook dentists often defer to an oral surgeon for extreme cases, we can help you make an assessment. If you live in the Mountain Brook area and have a mouth sore that lasts more than a week or two; come and see me. Mouth sores can be an indicator of disease, and an early assessment is the best bet. A better understanding of your mouth sores can lead quickly to comfort and a resolution. If necessary, treatment and pain relief can be offered. There are two common types of mouth sores that are common in the Mountain Brook area: canker sores and cold sores. 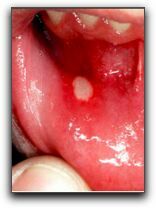 Canker sores are small ulcer-like sores with a white or gray base and a red border. They are found on the inside of the mouth and while they are not contagious, they can be painful. Typically a canker sore heals in a week or two. Antimicrobal mouth-rinses, over-the-counter topical anesthetics, and avoiding spicy and acidic foods may offer you temporary relief while your sore is healing. The cause of a canker sores is not certain. Possible explanations range from a cut on the inside the mouth, and reactions to extreme temperatures or acids from food or drink, to fatigue, stress, and allergies. Some studies point to bacteria or viruses, or combinations of all these factors. Cold sores, also called fever blisters or Herpes Simplex, are groups of fluid-filled blisters that often appear around the lips, sometimes appearing under the nose or around the chin. Cold sores are contagious and painful, but usually heal in about a week. Some over-the-counter anesthetics may provide relief. There are some antiviral drugs on the market that have shown promise in reducing outbreaks, but there is currently no known cure. The initial infection, known as primary herpes, often occurs before adulthood. Once the virus infects you, it may stay in your body and remain inactive or cause occasional cold sore outbreaks. Outbreaks may be triggered by a fever, sunburn, skin abrasions, stress, or exposure to extremes in temperature. As your Mountain Brook dentist, I can’t do much to stop canker sores or cold sores in your mouth. I can discuss the health of your mouth, and examine any causes that make your mouth sore. In some cases a change in the way you care for your mouth can reduce the chances of getting mouth sores. If you are in the Birmingham area, and would like to speak with a dental professional about mouth sores, give us a call at Koch Aesthetic Dentistry.